One of the things I’ve liked most about the Hayao Miyazaki films I have seen is that characters that would typically be seen in black or white terms, are in shades of grey. In Nausicaa, one can see this element in Kushana, princess of Torumekia. Sure, she conquers a peaceful village and kills their beloved king, but she’s doing this because she believes this to be the only way. She knows that the giant warrior cannot be brought back to her homeland, not only because the creature is too large, but because they will use it for their own gain. She wants to destroy the toxic forests, and the monsters that inhabit it. For Kushana, she is saving the world and uniting the kingdoms for the good of humanity. I love Miyazaki’s ability to make what could be the antagonist into a real human. But of course, the real antagonist of the movie isn’t in one single person, just as it often isn’t in life. In this particular movie, the antagonist is in the establishment of beliefs centered around the toxic jungles and her creatures. Kushana, in a sense, can be seen as the embodiment of these beliefs, but again, she is somewhat of a pawn rather than the most concerning opponent to the peace of their world. She’s humanity; even her body has been industrialized. She feels rejected by nature, and why wouldn’t she? She was literally scarred by its protectors, the insects, embedding in her a lifelong hatred for what had physically and emotionally maimed her. She wants so badly to believe in the ability and power of humanity to finally take their earth “back.” This desire leads her to place her conviction in the form of the giant warrior, able to destroy what is keeping humans from dominating. Unfortunately for Kushana, she misses what Nausicaä, the main character, has the wisdom to understand. Nature is not there to control. The people of the Valley of the Wind know that they must live beside the toxic jungles, that they must coexist with the terrors Kushana wishes to annihilate. 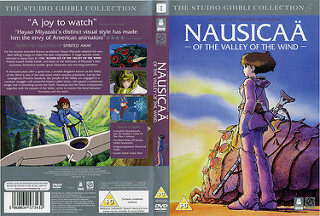 Nausicaä of the Valley of the Wind is the polar opposite of Kushana. Nausicaä easily communicates with the animal world, rides the winds, and even cultivates what was believed to be toxic plant life. She is unafraid of the toxic jungles, leisurely laying within the toxic spores at the very beginning of the movie. As a child, she befriends a baby Ohmu, a creature that horrifies most of the people of the world. She still considers herself a component of the natural environment, and this is proven with every daring feat she accomplishes within the movie. Clearly the movie is a story that has been told many times, but is still unheard. Nature is terrifying, and destructive, but it is also the giver of life and a creator of beauty. (Mind you, this is not the type of beauty that this word is now often inclined to be used for. Nature’s beauty doesn’t have to be just aesthetically pleasing to the eyes, it can even be found in things even humans do, things like love or altruism.) The movie warns of what happens when we cut off our connection with nature and take up a fight against it. It warns of what happens when we take and don’t return. Either we like it or not, we are a part of nature, it is evident in our abilities for destruction and creation, but if we lean too far on the side of destruction, it will not take long for nature to correct us, and then maybe we will be seeing the red eyes of the Omhu. Holly Wright is a returning adult student currently pursuing her bachelor’s degree in psychology and hoping to be accepted into a PhD program at SUNY Albany. She initially wrote this for my SUNY Adirondack course in science fiction and fantasy, English 217. In between school work she likes to write, read, watch TED talks, and spend time with her husband, daughter, two cats, and dog.